ROME IS NOW IN CHARGE OF PALMYRA: Emperor Aurelian (Ken Schwarz, right) addresses Queen Zenobia of Palmyra (Carolyn Vasko, center), her handmaiden Penelope (Katharine Bavoso, center back), and her general Zabdas (Jason Szamreta, left). An historical tragedy in formal blank verse, Zenobia is the story of the title characters rise to power as she takes the throne of Palmyra after her husbands mysterious death. Zenobia with her general Zabdas leads her nation in its conquests throughout Asia Minor and into Egypt, before the mighty Roman Empire, under Emperor Aurelian, strikes back and crushes the Palmyrenes, subjugating Zenobia. A Cleopatra known for her extraordinary beauty, as well as her spirit and courage, Zenobia, has been the subject of at least five operas, a portion of a tale from Chaucer, numerous fictionalized and nonfictional accounts and many works of art. The fact that many actual details of her story are sketchy and still disputed by historians provides Mr. Cheiten with ample opportunity for creative license in developing his action-packed, at times melodramatic, drama. In subject matter, form, and style, Zenobia resembles a Shakespearean history play with its portrayal of powerful leaders and momentous events, with its multiple scenes sweeping back and forth between Zenobias court and the attacking Romans. 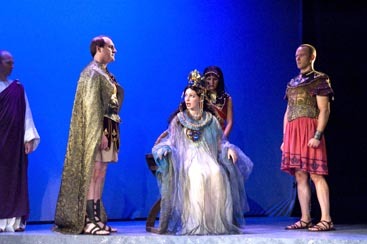 Mr. Cheiten fills in the historical gaps not just with dialogue but also with Zenobias inner thoughts as she reflects on her life and actions in a series of soliloquies, often directed towards an imagined manifestation of Cleopatra (lots of colorful, evocative fog in this production), Zenobias inspiration, confidante, role model. Mr. Cheiten also freely interpolates, speculates and adapts the historical records in creating the events of this life. Though known in history for her chastity, this Zenobia is flirtatious and passionate. Her affair with Zabdas, her general, becomes a central element of the drama. An additional subplot, a romantic tale of lasting love between Zenobias handmaiden Penelope and the Palmyrene warrior Heraculus, also enhances Mr. Cheitens drama, and provides enriching perspective. The character of Penelope also delivers the key to Mr. Cheitens creative depiction of the final chapter of Zenobias story, about which the historical accounts are widely disparate. The language here contributes significantly to the formality of the classical tragic genre  lots of thees and thous and methinks, along with the rhythmic, ten-syllable iambic pentameter lines and the frequent rhyming couplets to end scenes. In Shakespeare, amazingly, this formal, highly structured language seems to provide actors and directors with the means to bring to life vibrant, three-dimensional characters engaged in intense, realistic human situations. Unfortunately Zenobia lacks that magical poetry and prose, not to mention the depth of character development, psychological verisimilitude and humanity that bring those majestic, intense characters and their travails to life. Zenobia, and all eight of the characters in the play, are undergoing great emotional stress and moving, life-changing experiences. Often they describe their psychological stress and turmoil to others or in soliloquy, but it is difficult for the audience to care deeply. The history and characterizations are interesting, but less than fully engaging. What should be engrossing, riveting drama emerges at times as implausible melodrama. Shakespeares great history plays  Julius Caesar, the Henry plays, the Richard plays, and others even more loosely based on the historical record  certainly contain an array of diverse, compelling characters and complex plots, but those plays always seem greater than the sum of their parts. The immense human dramas transcend the individual characters and events. Not so in Zenobia, where all the elements for classical tragedy are present, but the effects are those of melodrama. Dan Berkowitz, Los Angeles-based director and playwright, formerly of Princeton and director of 22 productions at Murray Theater, including most of Mr. Cheitens plays, has staged Zenobia with skill, imagination, and intelligence. Bringing together a seasoned, professional cast and crew, Mr. Berkowitz achieves some powerful effects here. Carolyn Vaskos Zenobia presents an alluring, regal appearance as she progresses through the volatile stages of the final years of her life. Ms. Vasko, a Princeton University junior, delivers clearly and vividly the imperiousness, the ambition, and the coquettish behavior of this tragic heroine. Less convincing, however, are the moments toward the end of the play when Zenobias fortunes decline and she becomes more fully human and introspective, wondering, What have I done and what have I become? This Zenobia at times fluctuates distractingly between the worlds of classic tragedy and contemporary character drama. Jason Szamreta takes on the role of Zabdas with high energy and passion, formidable in matters of both war and romance. As Longinus, representative of the Athenian values of intellect, philosophy and the arts in Zenobias court, which was known for its culture and tolerance, the seasoned veteran actor Joel Rainwater is dignified, convincing, and sympathetic. The fearsome Roman contingent is led by Ken Schwarz as the Emperor Aurelian, who displays his power and authority in first taking control of Rome, then crushing the Palmyrenes and enslaving their queen as his concubine. Joseph Thomas as his conniving right-hand man creates an effectively villainous warrior and cynical commentator on the evils of war. Miebaka Yohannes appears as the Roman warrior Antigonus in the final scenes to provide effective narration and to preside over the fall of Aurelian, who pays the price for his conquests. As the second romantic couple, Penelope (Katharine Bavoso) and Heraculus (Ben Leasure), a young Palmyrene warrior, present credible characters and an affecting relationship. Presumably original creations of Mr. Cheiten, this couple serves as a foil to Zenobia and Zabdas and demonstrates an idealized vision of faithful, enduring love in the midst of the worst ravages of war. The minimalist set by Ben Schaffer leaves the stage almost bare, while the lighting and characters appearances and lines effectively accomplish the numerous changes as the action moves back and forth swiftly between Romans and Palmyrenes throughout Asia Minor and Egypt during the course of the evening. Excellent lighting by Christopher Gorzelnik richly enhances setting and mood throughout the play, especially striking in scenes of interior monologue when Zenobia alone communes with her thoughts. Costumers Marie Miller and Sarah Romagnoli contribute in major ways to establishment of the nature and status of these characters and to the ancient world setting, creating a formidable array of warrior garb for the soldiers, appropriate scholar/philosopher robes for Longinus and a stunning display of beauty, sensual allure and power in the gowns and robes of Zenobia. Ominous sound effects by Bill Kirby and original music by Jeff Ganz also assist greatly in establishing this militaristic world at war. An eerie light, with discordant music and a wisp of fog, is particularly effective, up to a point, in accompanying Zenobias soliloquies and evoking the spirit of Cleopatra, though that device does lose impact and novelty after several appearances. Mr. Cheiten and Mr. Berkowitzs new staging of Zenobia packs a heap of history and fiction, strife and romance into a fast-moving, two-hour drama. The sum of the parts here  rich content; interesting characters, relationships and conflicts; an able, experienced cast; top-flight professional direction and production values  is impressive, but the whole, despite best efforts on all sides, seldom manages to delve beneath the melodrama to fulfill the promised depth and intensity of serious tragedy. "Zenobia" will run for one more weekend, August 26-28, with performances on Friday at 8 p.m. Visit www.smarttix.com for tickets or call 877-238-5596 for information. Saturday and Sunday shows are canceled due to due to inclement weather.